Annotation: Say you've spent the first 10 years of your life sleeping under the stairs of a family who loathes you. Then, in an absurd, magical twist of fate you find yourself surrounded by wizards, a caged snowy owl, a phoenix-feather wand, and jellybeans that come in every flavor, including strawberry, curry, grass, and sardine. Not only that, but you discover that you are a wizard yourself! This is exactly what happens to young Harry Potter in J.K. Rowling's enchanting, funny debut novel, Harry Potter and the Sorcerer's Stone. In the nonmagic human world-the world of 'Muggles'-Harry is a nobody, treated like dirt by the aunt and uncle who begrudgingly inherited him when his parents were killed by the evil Voldemort. But in the world of wizards, small, skinny Harry is famous as a survivor of the wizard who tried to kill him. He is left only with a lightning-bolt scar on his forehead, curiously refined sensibilities, and a host of mysterious powers to remind him that he's quite, yes, altogether different from his aunt, uncle, and spoiled, piglike cousin Dudley. A mysterious letter, delivered by the friendly giant Hagrid, wrenches Harry from his dreary, Muggle-ridden existence: 'We are pleased to inform you that you have been accepted at Hogwarts School of Witchcraft and Wizardry.' Of course, Uncle Vernon yells most unpleasantly, 'I AM NOT PAYING FOR SOME CRACKPOT OLD FOOL TO TEACH HIM MAGIC TRICKS!' Soon enough, however, Harry finds himself at Hogwarts with his owl Hedwig... and that's where the real adventure-humorous, haunting, and suspenseful-begins. Самая лучшая сказка последних десятилетий! Обожаю все книги! It's short. That is pretty much only downside. Nice book. Easy to read! My lovely book)) i love J.Rowling very much. She`s very beautiful and great woman. Замечательная книга! Давно хотела прочитать её на оригинальном языке. This is book beautiful! I can read and read don't get tired. Sorry, i don't speak English, i only learning. 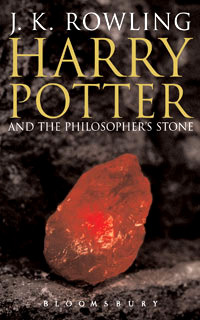 I think that all books of Rowling Joanne about Harry Potter written exelent. Because when you read you have relax, love, and etc with characters of the story. You can read and read this book for 100 times but i haven't boring. So i know that these books about Harry Potter is for teenagers, can get them a lot of life lessons. в оригинале - всегда лучше читать! Is this book original version? I mean, is it written in English language, not American? Гаррі Поттер -- це наше ВСЕ. І поки світом ходять такі люди (рівно як СБУ, вони теж герої), нам нічого боятись.